Technics have finally released specs and images for the forthcoming SL-DZ1200 CD deck and SH-MZ1200 mixer. Big up to Lee at www.dancefrontdoor.co.uk for the heads up. So far, I'm aware of 2 short movies showing off the newest gear - one from the guys over at Zone-Seven, the other from DJ Shy. We've know about this for nearly a week now but it's appeared on the Stanton forum so we figure it's OK to share with you guys - Final Scratch is finally making it to Windows. This is about as upfront as it gets. The event isn't even over and I've been sent a link to audio from the Vestax QFO night in LA - still happening as I post this message. Courtesy of turntabletv.com, these images show what should be the finalised design for the QFO. Yep - It's another pre NAMM announcement - this time from Tascam. A scratch controller for it's CD decks - makes for interesting reading. Numark's PR department have been busy. News just hit the skratchworx inbox about a whole load of new products. A portable deck (PT01), a USB mixer (DXM01), a dual DVD deck (DVD01) plus updated info on the 5000FX mixer and CDX. Some other less turntablist specific releases as well. Whilst not strictly a turntablists mixer, Denon have officially announced the DN-X1500 mixer. 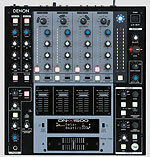 It's the ideal mixer for you Denon 3000 and 5000 owners. UPDATE - NYC DJ Big Al is the first person on the planet to take delivery of a Denon X1500. There's now a news archive page - the link is directly above the top news story.